As the N.C. House and Senate continue their Conference Committee to talk about the state budget, federal funding cuts loom overhead. President Trump’s proposed 2018 budget would cut non-defense programs by an estimated $2.5 trillion nationally over the next decade – the largest dollar cuts to programs for low-and moderate-income people proposed by any president’s budget in the modern era. Given the massive cuts to federal funding proposed by the President, North Carolina would have to come up with at least $13 billion in additional revenue over the next 10 years to maintain existing vital programs, according to a new report from the NC Budget & Tax Center. 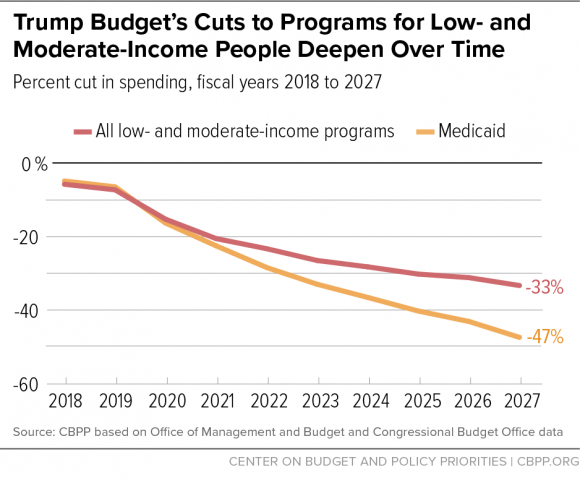 Under the proposed budget all low and moderate-income programs would see increasing cuts in spending over the next ten years, reaching a 33 percent cut in 2027. The President’s budget would require North Carolina to pay $562 million annually (25 percent) of SNAP (formerly known as food stamp) benefits by 2023. For NC, this means $3.9 billion over the next 10 years. NC would need to come up with at least $6 billion over the next 10 years to maintain Medicaid. In 2018 alone, North Carolina would need to make up $306 million to replace the loss of discretionary grant funding proposed by Trump’s budget. This includes cuts to Social Services Block Grant, the Low Income Home Energy Assistance Program, and the Community Development Block Grants.